On Thu Apr 13, 2017, a FOR Ranger program was presented to 93 fifth grade science students of teacher Phyllis Chappell at West Columbia Elementary. 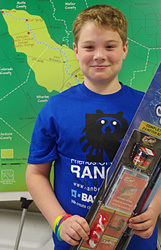 The students learned about the San Bernard River watershed and its environmental concerns. Points-of-interest along the river were discussed. A fish identification of species found in the river followed and then “mostly-true” fish tales were reeled off by the students. Last on the program was an active nautical knot tying session where students learned the proper knots to secure a boat to a dock. 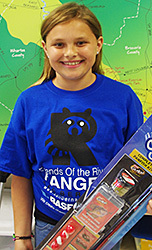 Each student received a packet of river information and a Ranger t-shirt. 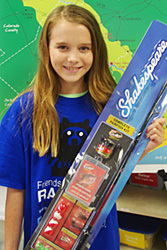 Also, four lucky winners each won a rod and reel. 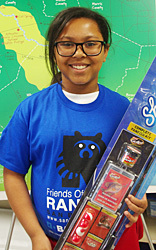 The Friends of the River Ranger program is an educational program for fifth grade science students to increase their knowledge and environmental concern of the San Bernard. It is a free to elementary schools and is paid for by donations to FOR San Bernard at the October “Escape to the Tropics” fundraiser. BASF is the sponsor / contributor of the blue Ranger racoon t-shirts.